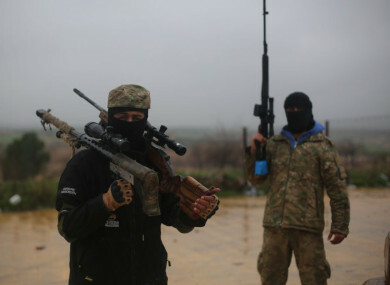 Turkey-backed Syrian militia members near the northern Syrian city of Manbij. THE US-LED coalition in Syria has begun withdrawing its troops, a spokesperson said today, less than a month after US President Donald Trump made his shock announcement. The force which has battled the Islamic State (Isis) group since 2014 has started scaling down, but it remains unclear how long the drawdown process will last. “CJTF-OIR has begun the process of our deliberate withdrawal from Syria,” Colonel Sean Ryan told AFP in a statement, referring to the US-led anti-jihadist force. Trump claimed last month that the jihadists had been defeated and that US troops could therefore come home. This claim was proven to be false by TheJournal.ie‘s FactCheck. Earlier this week, US National Security Advisor John Bolton laid out conditions for the pullout, including the defeat of the IS in Syria and guarantees for the safety of Washington’s Kurdish allies in the campaign, who have been threatened with an imminent offensive by Turkey. The People’s Protection Units (YPG), a Syrian offshoot of the PKK group which has waged an insurgency against the Turkish state since 1984, has already started cosying up to Damascus and its Russian sponsor. Turkey considers the YPG a terrorist group and has repeatedly threatened to move into Syria to create a buffer zone along the border. Critics of Trump’s decision, including within his own Republican camp, have said that a precipitous withdrawal would shatter US policy in Syria and allow IS to rebuild. They have also argued that it would further allow Damascus ally Iran to extend its influence across Syria and potentially threaten Israel. Since his surprise announcement last month, Trump has stressed any withdrawal would be coordinated, gradual and “prudent”. But observers have stressed that the announcement of the withdrawal was having the same impact in reshuffling the cards of the conflict as the withdrawal itself. “The damage is done. On the ground, the announcement of the pullout is as if they were already gone,” Fabrice Balanche, a geographer and Syria expert, said. Email “US-led coalition starts withdrawing from Syria amid fears about Isis rebuilding ”. Feedback on “US-led coalition starts withdrawing from Syria amid fears about Isis rebuilding ”.